Staff Photo by Robin Rudd Tennessee's Dillon Bates (17) comes up with a fumble recovery on a punt. Tennessee did not take advantage of the turnover. The Florida Gators visited the Tennessee Volunteers in a important SEC football contest at Neyland Stadium on September 24, 2016. KNOXVILLE — For the third time in four games the eulogies for Tennessee's 2016 football season were being prepared. Instead the only death sentence handed out on Saturday at Neyland Stadium was Florida's 11-year winning streak against their SEC East rival. Tennessee was booed off its own field going into halftime after falling behind 21-0, but the Vols staged a stunning comeback in the second half and scored 38 straight points against one of the SEC's best defenses to take early control of the division race with a remarkable 38-28 win at home on Saturday. After a brutal first-half performance the Vols looked like an entirely different team out of the halftime locker room as an offense began clicking and a depleted defense locked up Florida. After completing just seven passes and tossing an interception in the end zone, quarterback Josh Dobbs led Tennessee's charge with four second-half touchdown passes. Jalen Hurd and Ethan Wolf caught scoring passes in the third quarter as Florida's lead was slashed to 21-17 entering the final frame. Dobbs hit Jauan Jennings, who made a bobbling catch and stayed in bounds on his 67-yard touchdown pass to give Tennessee its first lead of the game, and after Todd Kelly Jr.'s interception, Dobbs hit a slanting Josh Malone for a catch-and-run 42-yard touchdown. A few minutes later Dobbs powered in from 5 yards out as Tennessee turned a 21-3 deficit into a 38-21 lead in a 14-minute, two-second span. 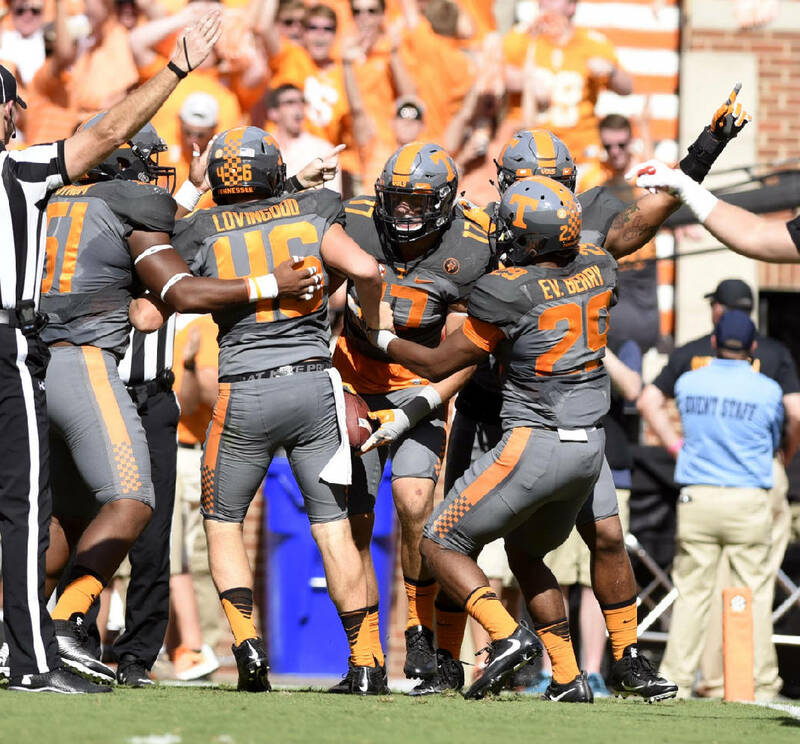 Defensively Tennessee stymied entirely a Florida offense that averaged 8.8 yards per play. The Gators didn't have a first down in the second half until Tennessee was up 17 with less than nine minutes left. Already without cornerback Cameron Sutton and linebacker Darrin Kirkland Jr., the Vols got star linebacker Jalen Reeves-Maybin for two or three defensive possessions and often rolled with a linebacker corps of Colton Jumper, Dillon Bates and Kenny Bynum, with Cortez McDowell and Gavin Bryant also seeing action. Freshman Baylen Buchanan also played extensively at cornerback. In the first half the Gators had seven completions of 15-plus yards and averaged nearly 5 yards per carry. Stand-in quarterback Austin Appleby had 213 yards passing and two touchdowns and Antonio Callaway had four catches for 134 yards by halftime. Whether it was failing to capitalize on good field position or dropping passes for big gains, Tennessee's offense couldn't get out of its own way in the first half and squandered multiple opportunities. The Vols couldn't punch it in after Callaway foolishly tried to catch a punt at the 2-yard line and fumbled it away and later went nowhere after starting another drive in Florida territory. Dobbs tossed a third down interception to Quincy Wilson in the end zone two plays after Hurd was stuffed for a 4-yard loss on first-and-goal at the 3 and later underthrew Alvin Kamara for a first down and possible touchdown on another red-zone trip on which Tennessee settled for a field goal. By the end of Tennessee's thrilling win the first half was a distant memory, lost in the euphoria of a momentous win.